Split Horizon protects against routing loops by not accepting routes on the same interface that a router sends updates out. This normally has to be turned off in hub and spoke topologies to ensure full reachability. 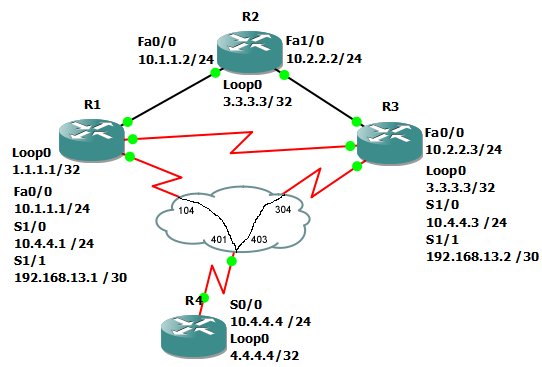 In this example we will configure EIGRP 100 on all routers in the in topology. Notice that EIGRP also stripes the network statements back to its classful network boundary. If we configure the network statement with a wildcard, we can control what interfaces are put into EIGRP. Checking the EIGRP routing tables we see that R1 and R3 have not received any routes. Now we will disable split-horizon on R4’s frame-relay interface. Now we see all the routes on R1 and R3.